Jamin and Wendy had six children in seven years. Even though they are both former school teachers, their two personalities are very different, and here they explore the differences and compromises that make their happy home. Wendy is an encouraging, optimistic, d-i-y, artsy stereotype of a kindergarten teacher. Jamin is practical, cynical, and contrary. 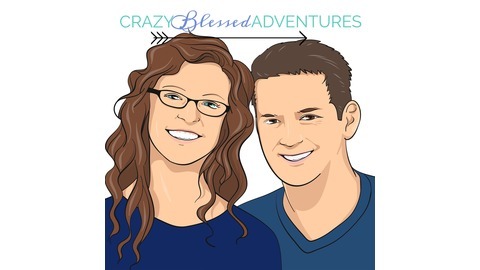 Listen as they both share their perspectives in ridiculously candid fashion on homeschooling, family culture, housekeeping, and your questions. 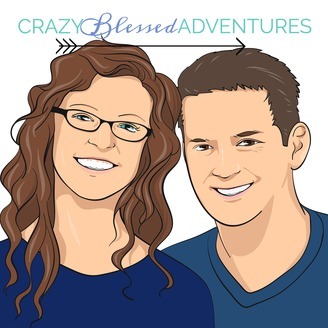 Join them on this crazy blessed journey to help their kids become the best versions of themselves. Wendy’s homeschool day with an 8, 7, 5, 4, 2 year old, and 8 month old: I am not a get-up-before-the-children kind of mama. My husband and I are both night people, and since I don’t believe in being out of bed before 7:00, it’s been a goal of mine to train all my children to sleep in as late as possible. It’s still a work in progress. 5:00 – The 4-year-old climbs in my bed. He needs a minimum couple hours of cuddle time each day. We snuggle up and both fall back to sleep. 6:30 – The baby wakes up. She’s not quite as easy. But I get her a bottle and eventually coax her back to sleep also. 7:30 – The 2-year-old wakes up loudly, waking up most of the house with her, which means I guess it’s time to give up the charade and head to the playroom. I make some coffee and bowls of Cheerios, and try to get in some reading. My current goal is to read some Scripture and at least ten minutes of another book each morning. The 4-year-old wants me to play Apples to Apples with him though, so I don’t quite make it to ten minutes, but I’m slowly working my way through the book. My other new goal is to blog for an hour in the mornings, but the big kids trickling out of bed want chocolate milk and the littles want more Cheerios. I do a round of diapers (there are three kids in diapers right now! ), then write a couple paragraphs. The three older kids play a board game, while the 4-year-old builds a Magnatile castle. The puppy needs attention, and all of a sudden an hour is up. It always goes way too fast. 9:00 – I have an alarm that goes off at 9:00. I prefer to structure our days more around flexible routines than around strict schedules, but I find babies get crabby if they don’t eat and sleep at regular times, so there are a few things I’m religious about in order to keep our chaos levels low. When the 9:00 alarm goes off, the big kids go get dressed and start their morning chores, including getting dressed, putting away laundry, and doing some cleaning on a rotating schedule. I’m super grateful to have my husband’s help overseeing this part of the morning! It’s one less conflict for me to have with the children in the day, and also gives me a few minutes alone while they’re working. This is where I’d normally make breakfast in the quiet kitchen, but today have an errand that has to be done, so Jamin takes breakfast on too. 10:00 – Kids finish eating and I send them outside to play while I try to finish my writing and some other household tasks. They all decide it’s too cold out, so five minutes later they’re back inside and start constructing houses out of a couple STEM kits that are on loan from friends. 11:00 – Another alarm: time for baby’s nap. Once she’s settled, we clean up and start Circle Time. Circle Time is basically singing and read alouds. I keep intending to add memory work to the rotation but haven’t done so with great consistency yet. We start with fun action and learning songs (current favorites are Just Dance Kids and Pancake Manor), then worship or Scripture songs (Seeds of Worship is awesome), and end with a hymn. All the songs are on a YouTube playlist that I turn on in the playroom and, yes, everyone dances on the table. Don’t ask me why, but it’s a thing here. After singing, everyone grabs their favorite coloring or art book and sits at the table while I read. I have a stack of books we loop through, reading a few pages of each one each day. Some days we only get through two or three books, on a good day we can get up to five or six. Since it’s a looping cycle, it’s ok if we don’t get through each one each day. Currently in our read aloud stack: Jesus Storybook Bible, a Beatrix Potter collection, Life of Fred, Ruth Heller’s parts of speech books, some Mem Fox picture books about Australia, and What’s the Matter in Mr. Whisker’s Room. 12:00ish – We finish up the reading and move on to language arts and math. Like read alouds, I have a set of language and math activities that we work through in a loop. I try to do at least do two activities a day so we’re touching both subjects daily, and ideally we’d do three or four activities each day, alternating between language and math. Today we do Mad Libs, a math lesson practicing multiplication and division concepts, and finish with Apples to Apples. The 7 and 8-year-old are required to participate in math and language time, while the 4 and 5-year-old get involved as much as they’re interested, finding ways to adapt the activities to their level. 1:00 – Lunch and quiet time. The kids are somewhat independent for lunch, with some parameters. I make a checklist on the chalkboard that the three oldest kiddos have to complete in the hour: lunch, math, reading, and writing. This is independent work, and allows me to help the 4 and 2-year-old get settled for quiet time, and then spend a few minutes checking in with each of the other kids on their progress. I listen to the 5-year-old read from a Bob book and one other book of her choice. The 7-year-old and I are re-reading Mouse and the Motorcycle together; he reads a page, then I read a page. Recognizing that he’s a super social kiddo who despises any solitary activity has helped me find better approaches for reading for him…making it a social activity has been a game-changer. The 8-year-old is a few chapters in on a book she’s writing, so she jumps through her math questions as quickly as possible to get to that. She finishes up her current chapter and brings it to me to read. It’s delightful, and I’m really enjoying watching her creativity and natural writing abilities blossom through this project. 2:00 – Normally at this point we’d transition back to the table to work on a science or history project. But today we’re meeting a new babysitter, the older sister of some of the kids’ co-op friends. She’s super adorable, the oldest of six children, and since she’s homeschooled, is available during the day. Major score!! The kids all think she’s fabulous. 3:00 – We have library books due today, so we head to the library. Our library has an amazing kids’ area, so we hang out there for awhile, while I look for more books to add to our read-aloud stack. Since we’re not typically there on Wednesdays, I didn’t realize they have a preschool story hour tonight. We stay much later than I’d planned, but it’s worth it. 7:00 – The 7 and 8-year-old have a Wednesday night church program they attend, so we head straight there from the library. I take the littles home, get them fed and ready for bed, and straighten up the house till the big kids come home. One more round of snacks and sippy cups and teethbrushing, and kids are all in bed. 9:00 – Since neither Jamin or I have had dinner, I pick up sushi, finish up my blog post from this morning, and get ready to record the post video with Jamin. We stay up working way too late, as usual. Every day feels like it races by and there’s so much more to do than time to do it in. But I feel crazy blessed to spend my days with my kiddos, investing in our family relationships and in our kids’ learning and growth. Tomorrow I’ll be tired, but grateful for the opportunity to do it all again. JAMIN RESPONDS: I don’t know how you do what you do, but I’d love to have the chance to try! You’re perfect for the job and I’m really glad to have you as my partner – you make a great home that I’m always eager to come back to. 2:00am – Go to sleep. Well…check Reddit and go to sleep. 3:30am – Get startled awake by a sharp jab to the ribs from the heel of a skilled striker between the ages of 1 and 4. I’ve now trained myself to sleep with my elbows down, ever ready to block the attempted morning karate drill and subsequent rush of fight-or-flight adrenaline. 3:33am – Touche, young karate kid. I did not block the flying ear-punch. Never mind. I’ll sleep in your bed now that it’s vacant. Seriously though – I would normally be opposed to this, citing some kind of bonding or attachment b.s. I vaguely remember from a pop parenting book. Of course, that would just be because I find it inconvenient. However, all the older kids have outgrown this phase and sleep in much later in their beds and already I miss their morning snuggles and frozen baby toes in the morning. Jamin, you’re gonna miss this. 8:00am – Go back to my bedroom to see if everyone’s there. My favorite mornings are when they are. 9:00am – Start and monitor the kids’ morning routine. 9:15am-ish – Try to be helpful and start the first of many cups of coffee that will enlighten my day. 11:00am – Realize I’m not being nearly as big a help as I would like to think I am. They’ve got this. They’re doing fine without me. Time to go make some money. 13 foot commute to work in the converted garage to answer emails, respond to the day’s video submissions, and teach people how take the next little step in their music journey. 8:00pm – Time to tuck the kids in and play video games with them if they are on purple. This is the best part of the day. 10:00pm – All the lessons are officially done. Check in with Wendy. Realize I haven’t eaten since breakfast, but decide I’ll just have a little bit to eat since it’s so late and it would be better if I didn’t eat so late. 11:15pm – Great ideas for the business. I’ll just take a second to knock a couple last things off my to do list while we watch Newhart or Newsradio in bed. 11:17pm – Change my mind about that eating thing. Ravage the kitchen like a angry grizzly coming out of hibernation. No carb is safe! 11:21pm – Shame. Shame and work. This is my most productive part of the day. Every one in my time zone is asleep or drunk, so I know no one is going to interrupt me and I feel like I’m getting ahead by working when they’re not. 1:30am – One last cup of coffee to mellow out for a good night’s sleep. WENDY RESPONDS: Oh my goodness. You’re so…honest. And we’re clearly not talking about the same day, since I said we were recording post videos past midnight, lol. But seriously, I’m really enjoying this season with you working from home and being as involved in our day as you’re able to be. Thanks for being so present and supportive; I couldn’t do it without you!